San Gimignano is a magnificent old medieval town up on the hill in the province of Siena, Tuscany in north central Italy. The authentic romanesque architecture of the whole place is very well-preserved, especially the centre. 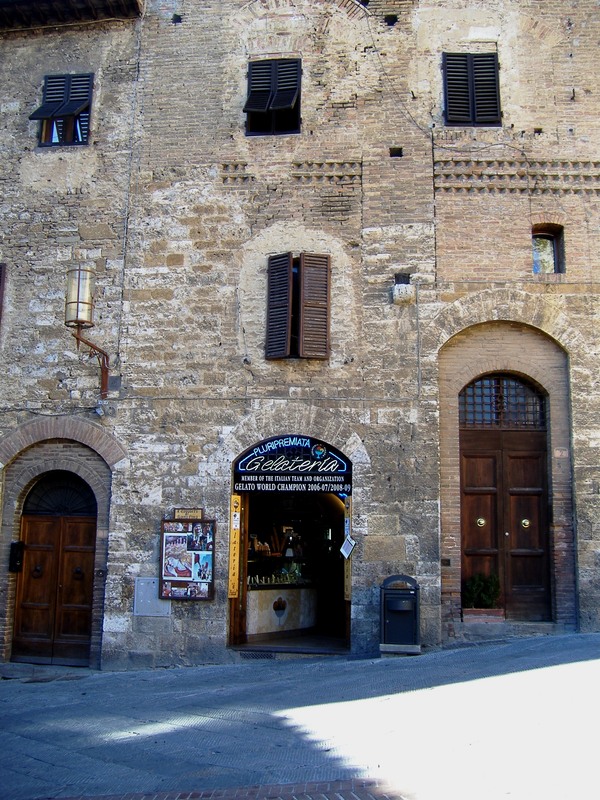 In the very heart of the town is the triangular-shaped square called Piazza della Cisterna which is the main piazza. 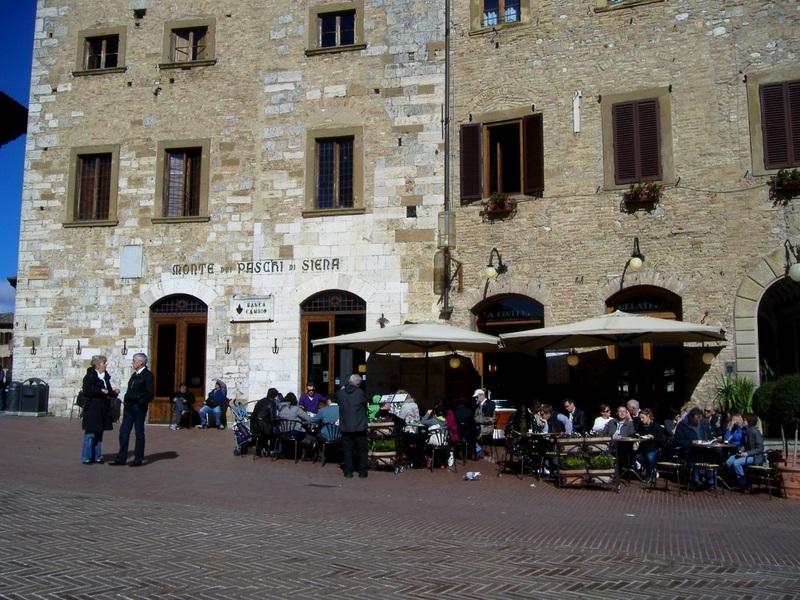 The Piazza is a lively square, full of people and has a wonderful atmosphere. 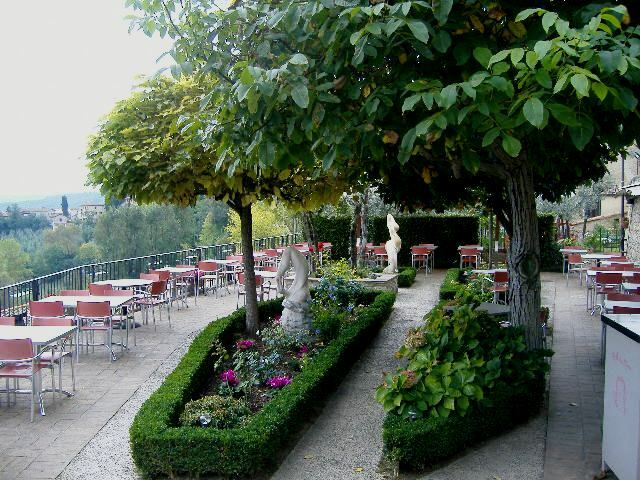 It is a good place to explore some of the delights of the town, or simply relax in a local cafe or bar and watch the world go by. 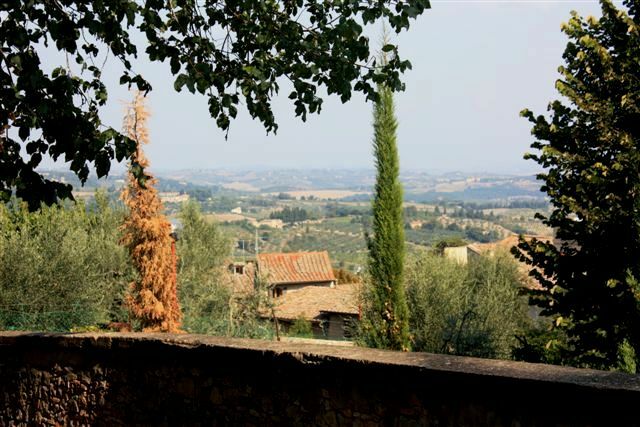 From the Piazza, it is only a short walk to many of the vantage points that San Gimignano offers of the surrounding Tuscan countryside. These views are simply stunning. 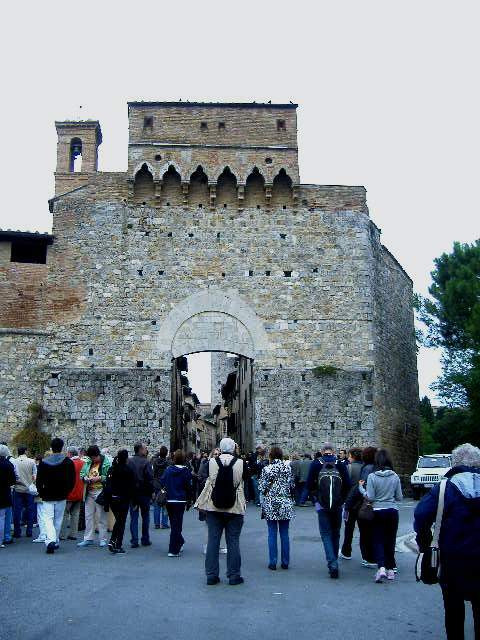 No visit to Tuscany is complete without a visit to this medieval town. We explored its narrow alleys and discovered so many interesting little shops and houses. Walking around San Gimingnano is like walking back in time. We felt like we were back in medieval times. It is a quiet little town without the crush of tourists and students. 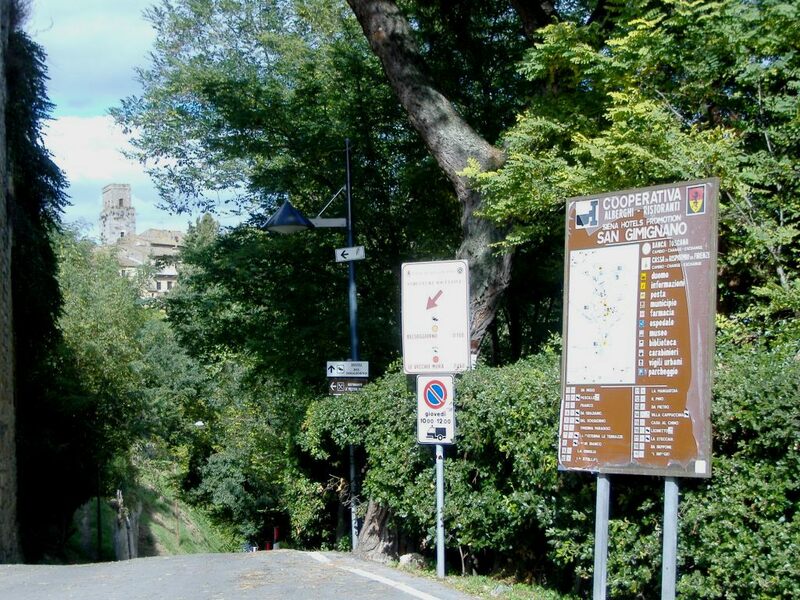 When we travelled to San Gimignano while staying in Florence we took the bus from the sita bus terminus next to the main train station in Florence. The station was a brisk walk from the monastery and only took about 15 mins. There are regular buses from Florence and Siena. 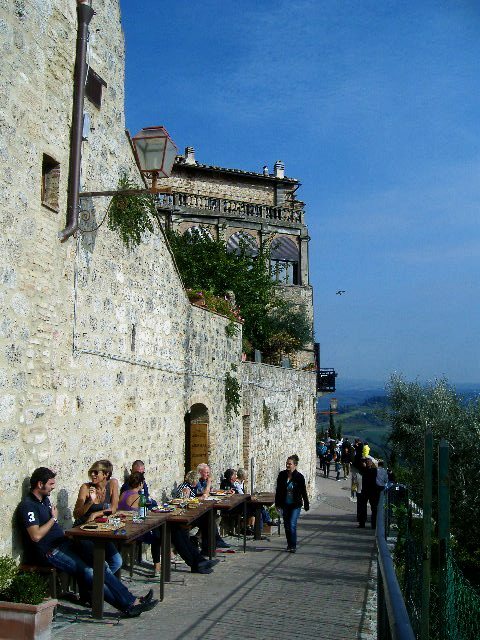 We took the bus to Poggibonsi where we had time for a coffee and dolce before taking the bus up to San Gimignano. Thursday is market day and the Piazza is then full of vendors selling primarily clothing and fabric with limited food. 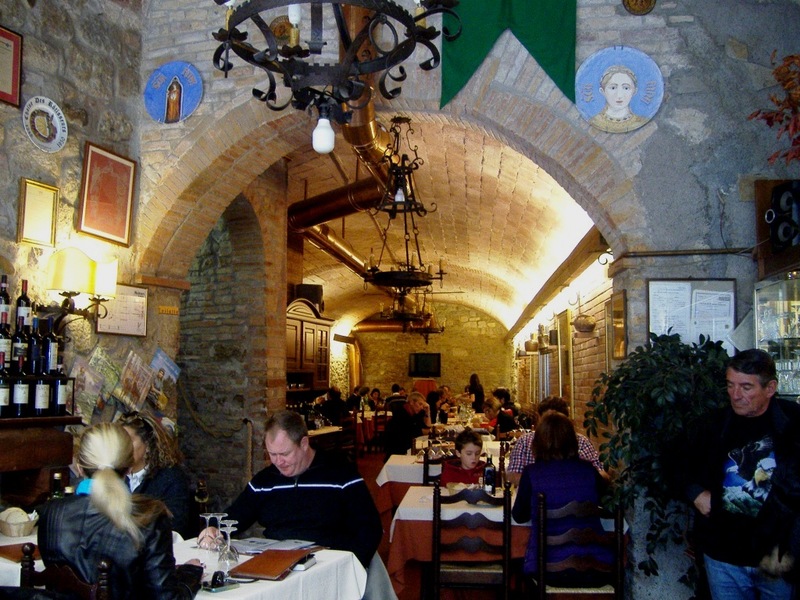 If you are in the area, San Gimignano, the city of beautiful towers, is a must visit. Like many of the mediaeval towns and cities in Tuscany the centre is essentially vehicle free and parking is a challenge. Panoramic photos are from Wikipedia. Once again you have captured the feel of the city perfectly. Thanks so much. I only spent an afternoon in this town, but was amazed by its quaintness and beauty. Thank you for sharing. 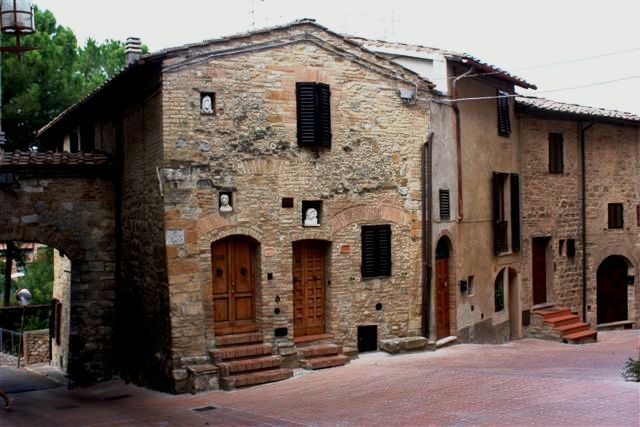 That brings back wonderful memories Lyn…such an iconic Tuscan town – beautiful! I loved your post with all those medieval photos! I visited San Gimignano once and would love to go back. Aren’t all those towers intriguing? Thank you for a great early morning escape! Lyn you are such a marvellous photographer – looks like you could almost be there.